Inside the occupation of the tower. 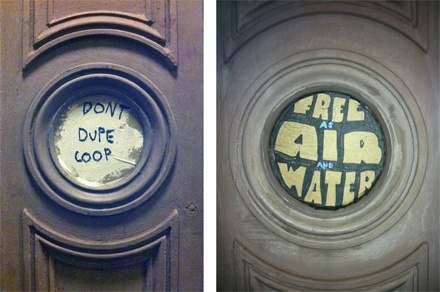 All images courtesy the Students for a Free Cooper Union, unless otherwise noted. 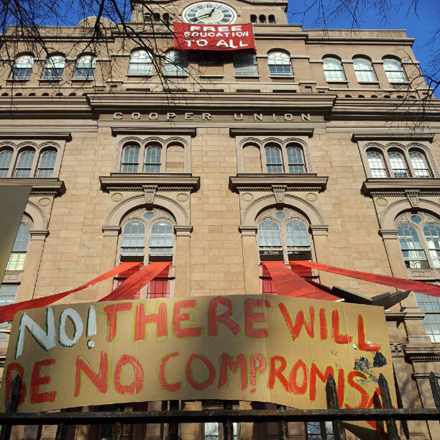 Earlier this week, Art Observed reported that students at Cooper Union, the country’s only traditionally tuition-free art school, have barricaded themselves into the top floor of their school in an act of protest against the school’s recent economic scandal. Last year, after years of hiding its financial situation, the school’s administration revealed that they are in a $17 million debt that could leave students paying tuition as soon as 2018. Although there has been minimal response thusfar from the school’s administration regarding the students’ actions, support has steadily grown, especially from faculty members. The media response to the students’ actions has been far-reaching, from early coverage by Art in America to mainstream media sources including MSNBC, CBS, The Wall Street Journal, and The Rachel Maddow Show. Art Observed’s Jennifer Lindblad reached out to occupying students to hear their experiences and reflections so far. 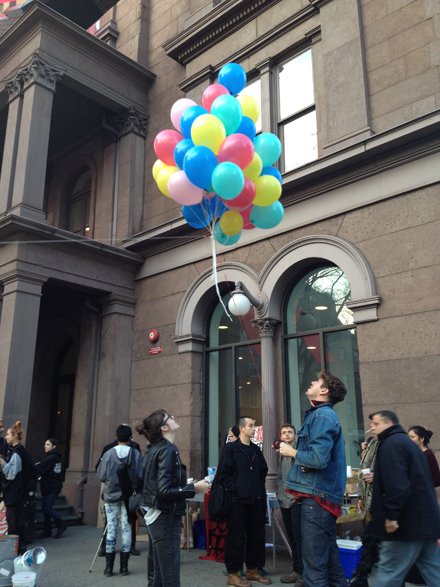 Occupiers receive a delivery by balloon at the Cooper Union Foundation Building on Tuesday, December 4th. Photo by Phoebe Pundyk for Art Observed. 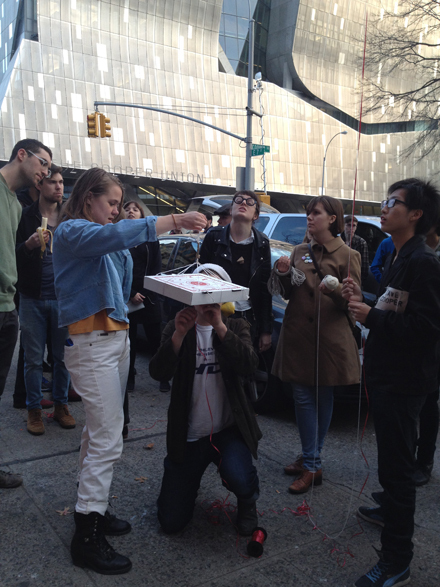 The group, which calls themselves Students for a Free Cooper Union, numbers eleven. All are enrolled in the School of Art and are representative of all class years. 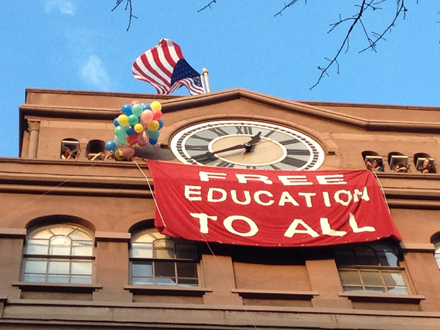 By far the most visible element of their protest is a red banner proclaiming “FREE EDUCATION TO ALL,” which flies from the Peter Cooper Suite on the eighth floor of the historic building (being referred to as the clock tower). 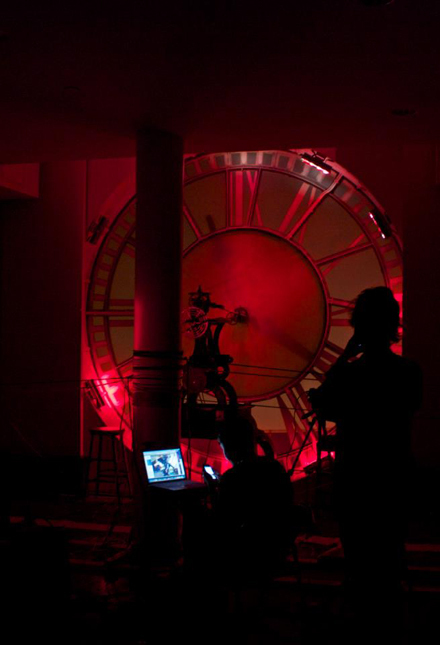 The clock tower boasts views of supporters below in Cooper Square, who show their solidarity daily by holding candlelight vigils each night and sending handwritten messages and rations up to the occupiers by way of a complex balloon and pulley system. Faculty members speak during the Day of Action on Monday, December 3rd. Photo by Phoebe Pundyk for Art Observed. The students pose together before their press conference on Tuesday, December 4th. 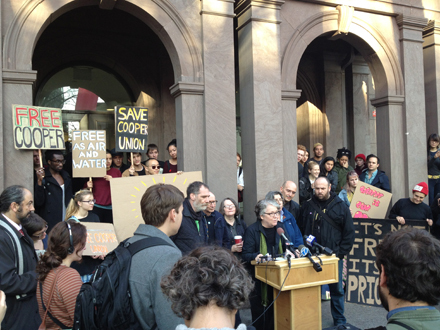 In their address to the administration, The Students for a Free Cooper Union state that they will not leave the space until their demands are met. What they are asking is threefold: for public affirmation of the college’s commitment to free education, for the Board of Trustees to be more transparent and inclusive, and for the resignation of the school’s president Jamshed Bharucha, who has been in office since July 2011 but has remained largely silent throughout the students’ protest. They are active on both Twitter (@FreeCooperUnion) and Facebook, already showing over almost 1,000 followers and 1,200 likes respectively at the time of publication (and all this is in just four days). The administration’s response does not echo the faculty’s sentiments. Yesterday, the administration responded to the students’ occupation by issuing an insubstantial press release on the school’s website (pictured below) which merely expressed concerns over the safety of students and the disruption of classes, promising a “dialog” [sic] with the students that has heretofore not been met. The students replied, “President Bharucha’s email to the student body is an exceptional farce” and responded to the email point by point on their website. When reporters from Democracy Now asked for a comment from President Bharucha, he praised the students for speaking their minds, but as soon as the question “Will Cooper Union remain tuition-free?” was raised he walked away. Wednesday morning, across the street from the occupation, Cooper’s Board of Trustees of the three schools (art, architecture, and engineering) met to discuss revenue generating programs. Sixty-five plus students came to protest this as a plan of action. Although barred from the meeting, one student blocked the door so that a few were able to enter (and board members were unable to exit). Deeply symbolic actions took place: one student held up a portrait of the school’s founder Peter Cooper for the board members to gaze upon, while another cried in front of the President. Yet another removed a portrait of President Bharucha from the wall, replacing it with the portrait of Peter Cooper. Amidst chants of “BHARUCHA STEP DOWN”/ “WE SUPPORT THE OCCUPATION”/ “WE ARE THE OCCUPATION”/ “WE SUPPORT THE FACULTY / “YOU ARE NOT OUR PRESIDENT” / “WE SUPPORT THE MISSION OF OUR SCHOOL,” the board struggled to hold its meeting. A student took public minutes (echoing one of the students’ demands for the administration’s transparency) and made them available via Google Drive. The meeting was made available by students via live stream. Left: Screenshot of the live stream of the Board of Trustees meeting Wednesday, December 5th. Right: Student crying in front of the school’s president Jamshed Bharucha, photo by Ian Langehough. Screenshots of the live stream of the Board of Trustees meeting Wednesday, December 5th depicting a student removing the portrait of President Jamshed Bharucha from the wall, to the left is Chairman of the Board, Mark Epstein. Live stream features heavily as one of the tools the students are finding most effective in disseminating information. Wednesday evening, after over 48 hours of occupation, a live stream of protest was projected onto the sidewalk in Cooper Square, a mashup of classic old-school and new-school techniques of protest. 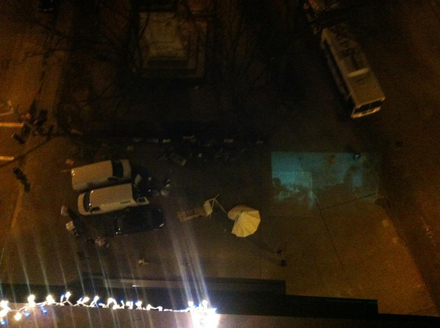 View from the Peter Cooper Suite on Wednesday night, with live streaming protest projected on the sidewalk. Students decorated nooks in the ground level of the Foundation Building with slogans pertaining to their cause. One of the earliest acts of solidarity came from a group of Cooper freshman, who staged a sit-in a few levels down in the same building on the first night of the occupation. Although they were asked by the school’s security to leave, the students remained in the studio space overnight, buoyed by hammocks and a mission to protect the legacy of their school. Following Wednesday’s board of trustees meeting, students in Cooper Square performed a “Transparency Parade” in which a circular barricade was constructed from saran wrap. Cries of “Where’s our president?” rang out as the students marched in circles. The Students for a Free Cooper Union have been contacted by students all over the world, including letters and tweets of solidarity from UCLA, Harvard, NYU, The New School, and as far-reaching as The Netherlands. Casey Gollan, who is a senior in the School of Art and one of the eleven, shared early concerns over a polarization effect: that it would be the activists vs. the rest of the student body. In fact, the protest has had the opposite effect bringing together three disparate groups (art, architecture, engineering) towards one common goal. An existing unification group on Facebook saw a sudden influx of activity, surpassing 500 members, and decided to host an event in Cooper Union’s engineering labs tomorrow to foster more cross-disciplinary discussion and show their support. BHQF pizza delivery. Photo by Phoebe Pundyk for Art Observed. 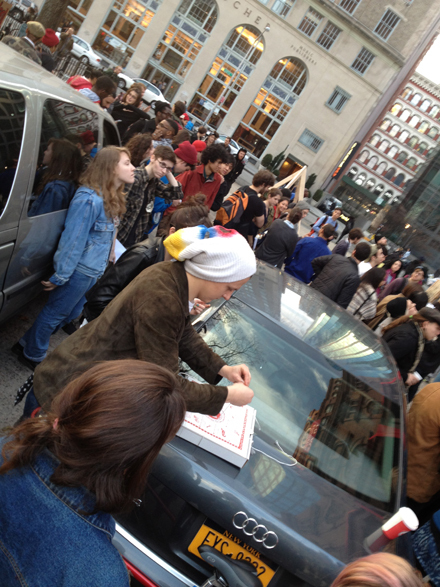 One of the most poignant moments of the occupation thusfar has been the pizza delivery to the Peter Cooper Suite by artist group The Bruce High Quality Foundation, many of whom are themselves graduates of the college. Initiating what Gollan called a sort of “advent calendar of solidarity,” the BHQF installed a blow-up rat in Cooper Square on Monday. 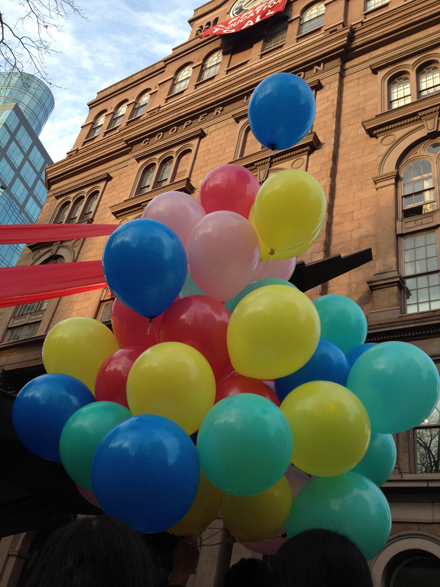 On Tuesday, they contacted the students with a wish to send them a pizza delivery by way of balloons. A complex pulley system was created, and the event became the focus of the Rachel Maddow segment entitled “Of Protests and Pizza Pulleys” (the clip aired Wednesday night). On Wednesday they delivered Christmas lights, which the occupying students strung across the windows in the Peter Cooper Suite. It’s anyone’s guess what these wise men will offer up in the coming days– or longer–however long it takes for their demands to be met. Perhaps one of the most fascinating aspects of the occupation so far has been the opportunity to watch a live stream (via OccupyNYC) of the students’ work room in the Peter Cooper Suite. Watching the dedication of these capable students as they think, tweet, rig pulleys, occasionally jump rope and fight for their collective belief in free education is astounding to watch. 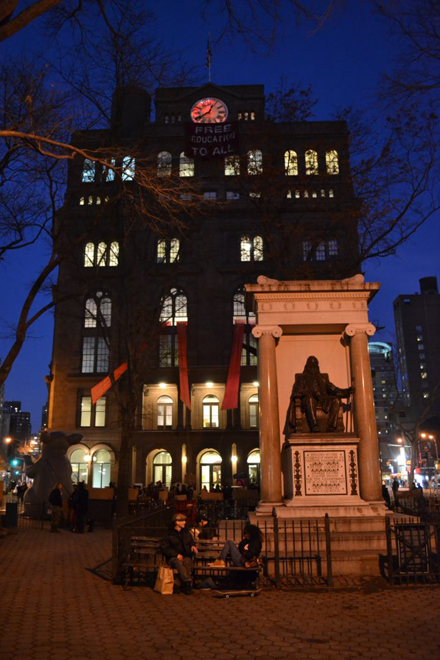 When Art Observed’s Jennifer Lindblad spoke to the occupying students Wednesday evening, they had just completed hauling in the red banner due to expected high winds overnight (it has since been restored). It was almost midnight, and a wave of fatigue was beginning to settle in. 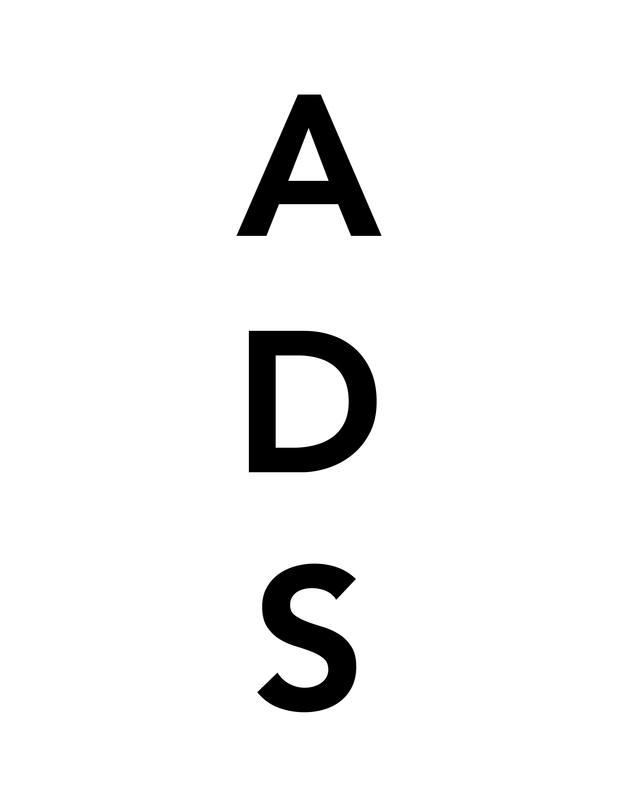 Art Observed: Hi guys, how are things going up there so far? Tyler Berrier (CU ’14): They’re good! It’s going on longer than I had thought it was going to, but it’s really good. Casey Gollan (CU ’13): Yeah, support is building. People are reaching out– from pizza to love letters to database reporting. AO: Can you characterize the general atmosphere in the room where you are? Josiah Ellis (CU ’15): It goes through phases… Mostly it’s milling about, then it gets really exciting for a bit. There’s a lot of talking on phones, it’s really loud. Kristi Cavataro (CU ’14): We’re tired, I expected that we would have a lot of down time but it’s been really busy. AO: This all started last year and the protest has taken many various formats since then. When did it become apparent that occupying was the next course of action in terms of drawing attention to the issue and activating a real response from the administration? TB: It felt like everything we did last year was “going up” a step in action: first posters, then walkout, second walkout, the student who mounted the statue of Peter Cooper and was arrested… We threw around the idea of an occupation last year but it didn’t take shape until now. TB: There’s this sense of urgency and a feeling that other things havent worked and this was our only recourse. KC: I was pretty active in various protests and student actions last year and I think there was progress, but it felt like delaying and disrupting rather than moving forward. We still haven’t seen any systematic change in terms of the governance of the school. And yeah, there’s this weird sense of urgency, that earlier this semester we had already tried everything else–protests, walk outs, candlelight vigils–and our existing channels of communication hadn’t seen much progress or change. So this semester we needed something new, bigger, and more radical, and something that instead of just raising awareness to the public or putting pressure on administrators, demands real changes. A lock in was the answer to that call. JE: I think a lock-in was the most attention-getting thing we could think of and we knew we needed a lot of attention. AO: Well it’s obviously worked, look at the media coverage you’ve been getting. What have been some of the highlights for you, in terms of the many supporters worldwide who have shown their support? TB: The tweet from Russell Simmons, definitely. And of course the Rachel Maddow Show. We were just talking about how it was like, the perfect tone. It gave some good historical context, but then was also lighthearted. JE: Yeah, watching Rachel Maddow… But also the people outside, the people we know. It was really crazy watching my friends disrupt the board room meeting, I was really worried for them– how the board would react, that they could be singled out. KC: One of the most emotional moments for me was this morning when we were watching the live stream. These freshman got into the meeting, it was such an amazing, brave, courageous and all-around awesome thing to do, and also the fact that it came from someone who’s only been at the school for a few months! That was one of the most incredible autonomous acts I’ve witnessed, a real gesture. I feel like we’ve been a catalyst for energy downstairs to build. JE: It’s like we’re up here and causing all this energy and we can only see it, but it’s not affecting us directly. AO: Also because you’re experiencing it through a screen– with the live stream. JE: I’m not a big computer guy, I haven’t been at the computers a lot. AO: What were some of your biggest worries or concerns before the occupation, and how have some of those worries been allayed or transformed since you’ve been up there? KC: I thought, “What if we can’t lock ourselves in? What if someone gets wind of our plan?” Those knots in our stomachs about the risks were high before but feeling the support of everyone, we feel feel safer, warmer and empowered as we go forth on our second stay overnight. JE: The half hour before going up was filled with butterflies, then it went very quickly with the elevator, we all ran out and had our assigned things to do in order to set up and prepared very quickly. One barricade didn’t fit so we had to saw and fix it really quickly. Then we heard maintenance trying to get through the door and adrenaline was pumping. We all put our bodies against the door and yelled “our bodies are against the door!” and it was really tense. AO: And how soon after you got up there did maintenance try to break in? AO: Had you thought about building an amnesty clause into your list of demands? TB: We studied the New School Occupation pretty heavily, and it became apparent that one of their mistakes was that the amnesty clause was too high on their list of demands. We felt it took away some of the power, we wanted to show our dedication. CG: We’re frustrated with the bureaucracy here inhibiting free education, and we took a lot of inspiration from horizontal structures and methods from Occupy. AO: I feel like one of the biggest differentiations between previous acts of protest regarding the Cooper Union crisis is the presence–finally–of the faculty’s voice. KC: We knew all along that our fellow students and faculty supported us, but [the lock-in] acted as a catalyst for them to voice their support on this issue more loudly and more urgently. A lot of people felt burnt out from last year and were waiting on a big action to push people to start talking about it again. It’s really exciting to see. Faculty has been suppressed for fear of losing their job and we’ve given them an opportunity, something to rally behind. TB: We erred on the side of excess, so we’re prepared. AO: How feasible do you think your demands being met really is? What’s on the horizon for the coming days? TB: Sometimes it feels really feasible, other times not. KC: It really feels like our big dreams aren’t that far fetched. There is an emergency faculty meeting Thursday morning, so we’ll see what that brings. CG: A lot of people are reaching out to help us get organized in terms of our information and data. AO: So where/how do you expect to go from here? In an ideal world, how would this end? TB: Our demands would be met and that would be that. We’ve been discussing a citywide event for afterwards, involving colleges from all over the city. As you know we’ve been receiving a lot of letters of support from other institutions so it would be cool to do something on that. AO: Well good luck. You definitely have our support. 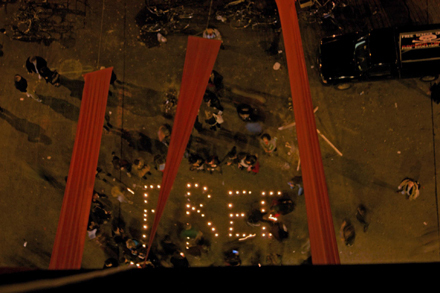 Shows of solidarity as seen from the Peter Cooper Suite. This entry was posted on Thursday, December 6th, 2012 at 2:23 pm	and is filed under AO On Site, Interview. You can follow any responses to this entry through the RSS 2.0 feed. You can leave a response, or trackback from your own site.